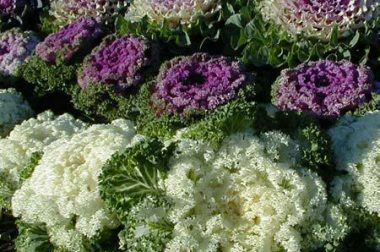 Ornamental cabbages and kales are prized for their brightly colored foliage. •The ‘Chidori’ series has mounded kale types with purple foliage, extremely curly leaf margins and cream white or deep magenta centers. •The ‘Color Up’ series has cabbage types with upright, columnar growth habits and green leaves with colored centers in white, blush pink or fuchsia. •The ‘Nagoya’ series has round kale types with heavily crinkled leaves and tight rosette centers that range in color from fuchsia pink to lavender to yellow green to creamy white. •The ‘Osaka’ series has fast-growing, compact cabbage types with bluish-green, semi-waved leaves with pink, red, or white centers. •The ‘Peacock’ series has compact hybrids with deeply serrated, feathery red or white leaves. •The ‘Pigeon’ series has flattened cabbage types with red or white centers. •The ‘Tokyo’ series has nearly perfectly round cabbage types with smooth, blue-green outer leaves and soft pink, red, or white centers. Where do I get ornamental cabbage and kale? Ornamental cabbages and kales do not tolerate summer heat, so you need to start plants from seed in mid-summer, or purchase transplants at your local garden center. Sow seeds about six to 10 weeks before the expected date of the first frost in your area. Seeds must be sown and young plants kept under cool conditions to thrive. In most climates, this means plants should be started in a greenhouse where the temperature can be controlled. Alternatively, you can place pots with seeds in a refrigerator for several days to encourage germination. In cooler climates, sowing seeds directly in the garden may be possible. Ornamental cabbage and kale seeds require light for germination, so seeds should not be covered with soil. 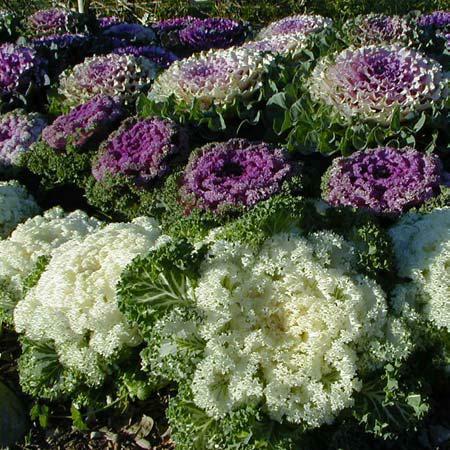 When purchasing ornamental cabbage or kale transplants, look for large, compact plants that are nearly or fully colored. Plants will generally not get much bigger after they are planted in the garden, particularly if the roots are pot bound. Therefore, be sure to buy appropriate-sized plants for the location where they will be used (even though bigger plants will cost more). How do I grow ornamental cabbage and kale@f1 Wait until temperatures start cooling down, then plant ornamental cabbage and kale in a sunny location in a moderately moist, rich soil. Bury stems so that the lowest leaves of the plants are flush with the soil surface. After planting, keep the plants well watered. Until cool weather arrives, plants won’t have much color. White, pink, or red pigments will begin to develop when temperatures dip below 50°F. Once acclimated in a site, ornamental cabbages and kale can survive temperatures as low as 5°F, so plants may last well into November and December. Ornamental cabbage and kale can have problems with cabbage worms (see University of Wisconsin Garden Facts XHT1029, XHT1031 and XHT1032), cutworms (see University of Wisconsin Garden Facts XHT1030), aphids (see University of Wisconsin Garden Facts XHT1043), and slugs (see University of Wisconsin Garden Facts XHT1040). However, because ornamental cabbage and kale are typically grown late in the growing season, they usually have fewer problems with these pests than if they were grown earlier in the year. 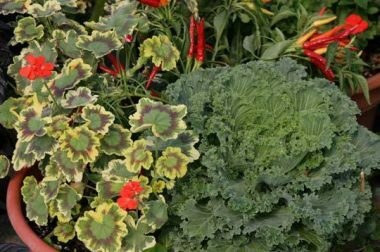 How do I use ornamental cabbage and kale most effectively in my garden@f2 Ornamental cabbage and kale are great for replacing worn out summer annuals for a long-lasting fall display. Try to position plants to best expose their colorful centers. Use them in mass plantings, in mixed or single container plantings, and as edgings. They look beautiful in the front of a border, especially when combined with perennials that are at their peak in the fall, such as little bluestem grass (Schizacrium scoparium), tall, dark-leaved sedums (Sedum spp.) or asters (Aster spp.). 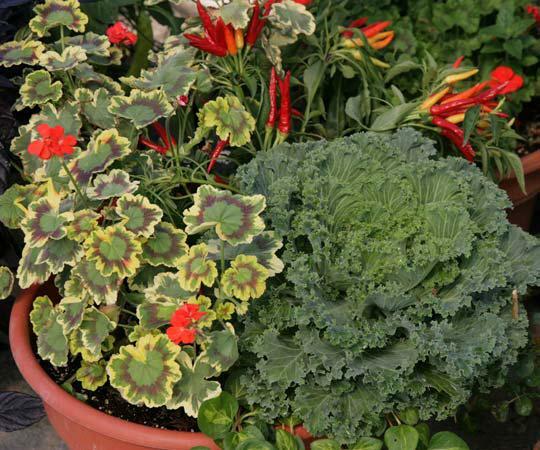 For an easy and attractive container planting, place an ornamental cabbage or kale in the center of a container and surround it with pansies. Or try them with other plants that can tolerate light frosts [e.g., Swiss chard (Beta vulgaris var. cicla), snapdragons (Antirrhinum spp. ), petunias (Petunia spp. ), or chrysanthemums (Chrysanthemum spp.). As noted above, ornamental cabbage and kale are edible. To reduce their bitter taste, boil them, discard the water, then either boil them again or sauté them in olive oil prior to serving. Ornamental kale combined with summer warm season annuals as a foliar contrast.